Owners of local rental properties addressed the City Council on March 18 regarding an ordinance that has now been tabled. 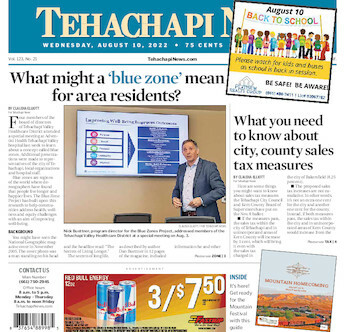 The city of Tehachapi has tabled a proposal to require owners of rental properties to pay for a business license that would come with an annual inspection. The proposed ordinance, which was intended to help the Tehachapi Police Department address chronic and nuisance properties, wasn't on the March 18 City Council agenda. But it came up when the public questioned its status. She added that even though cities across California require landlords to have a license, it does not require an annual inspection fee or inspection by a police department. Helen Lantz, a local rental business owner, asked if the business ordinance would be tabled or put on a future agenda. “I keep hearing in all my phone conversations that it's been tabled or it's pulled," said Lantz. City Manger Greg Garrett said, “The City Council directed us to put it on an indefinite hold. It doesn’t mean we will bring it back next week or in a year or more. Who knows?" Garrett added that staff members researched how such an ordinance works in other communities and found it worked well for them. But, he said, "The democratic process through this public meeting said, ‘No, we don't want it in Tehachapi.'" The proposed ordinance was designed to help the city, in partnership with the Tehachapi Police Department, reduce the amount of time spent on crime, make sure buildings are adhering to Tehachapi's zoning code, and ensure good maintenance and cleanliness, landscaping, and other items, according to documents in the March 4 City Council agenda. The topic was to be discussed further at another City Council meeting, although a date had not been set. An email from the Tehachapi Area Association of Realtors on March 13 said the city informed the association that there was an “indefinite hold on this new ordinance pending further review” and this item wouldn’t be on the next City Council agenda.